This looks like something that came about when RZA thought to himself one day - hey, I like Kung-Fu movies and I got money and friends in the movie industry, so why couldn’t I pump out an awesome Kung-Fu flick of my own? It helps when those friends are Tarantino and Eli Roth and when you’re a member of the Wu-Tang Clan. I can’t say this is a good movie, not in the sense that things like Sukiyaki Western Django or Machete are any good. This is pure throwback to B-movie territory in the vein of Grindhouse, albeit playing with the classical Kung-Fu flick genre. 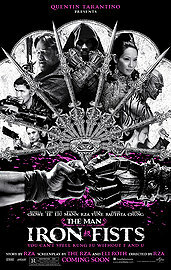 It’s entertaining to a certain extent, especially considering the always wonderful Lucy Liu’s participation and Russel Crowe who seems to have put on a bit weight and was just having fun in this, wielding a steampunk-style gun-knife. RZA makes sure, like his alter-ego in Californication, Samurai Apocalypse, that he comes out on top, no matter what. From his tongue-in-cheek ‘blacksmith’ character (get it, his real name is Henry Smith, but he’s also black - hence: blacksmith), to the fact that he’s a freed slave (Henry Smith, curiously, is a famous lynching victim, not sure if related), to the fact that his mother in the flashbacks is Pam Grier, RZA works hard at establishing a link between african-american history and the world of Kung-Fu. Overall it’s a fun little movie, ultimately not excelling in neither comedy nor Kung-Fu or film-making, but what it lacks in technique it makes up in nostalgia and plain old silly fun. I couldn't have imagined anything else coming from the RZA, and in that sense, he delivers on exactly the expectations that fans of the Wu-Tang clan have come to expect, be it for better or worse.